To enable us to provide the best quality service during your assessment we use a cutting-edge equipment and computer analysis software to allow us to measure and interpret what it happening to your body, legs and feet as you move. 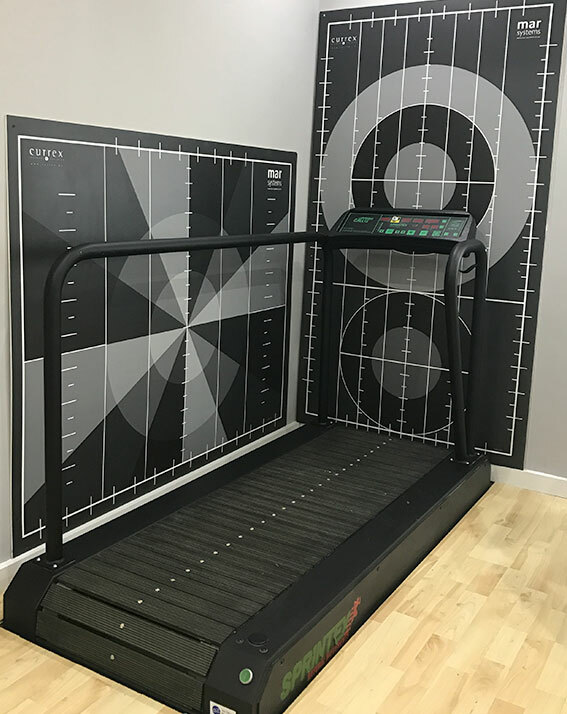 Unlike a normal treadmill the Sprintex treadmill does not use a belt but individual rubber slats engineered to encourage natural and independent gait behaviour. This recreates running on the road more accurately as it eliminates bounce and provides a more realistic ground reaction force. This in turn delivers more accurate results. The video cameras used work at very high speeds capturing up to 50 frames per second when a patient is running. By slowing down the playback we can study each frame which enables us to review your gait cycle in great detail. The eye by comparison is only able to view 7 frames per second and as a result important information is often missed. Information gathered from the video cameras is interpreted using state-of-the art software. Templo video software allows several cameras to be used at the same time, capturing multiple views when a patient is running. The software allows us to compare these different views i.e. bare foot, with shoes, with shoes and orthotics. We can demonstrate the magnitude of movements and measure angles. As well as interpreting the data we can use Templo along with its sister programme MotionQuest to create your personal analysis report. Is a fantastic tool that provides a personalised analysis report as well as your video gait analysis findings. We can prescribe a personalised stretching and strengthening regime, shoe recommendation and information about your injury and its cause, plus all the information obtained during your gait analysis.